The #4 Denver Pioneers (6-2-1, 4-1-1 WCHA) leave Colorado for the first time this season with a two-game WCHA series at unranked St. Cloud State (5-4, 0-3 WCHA) on Nov. 14-15. Denver owns a 35-27-4 advantage over St. Cloud State in the series that dates back to 1988. The Pioneers are 18-10-2 all-time against the Huskies in St. Cloud. DU is 3-2 in its last five meetings against the Huskies and 7-3 in its last 10. The winning team has netted two or more goals in the last 17 meetings. The Huskies have had solid start in non-league play, but have yet to win a conference game. They return some of the nation’s finest offensive players, sophomore Garrett Roe (left) and junior Ryan Lasch. Roe leads the team with 4-11--15, while Lasch recently tallied his 100th career point and has added 1-7—8. SCSU is solid in goal with Jase Weslosky at 3-3 record, 2.52 GAA and .921 saves percentage. St. Cloud State University (SCSU) is part of the Minnesota State Colleges and Universities (MnSCU) system, located in St. Cloud, Minnesota on the banks of the Mississippi River. Currently, there are nearly 17,000 students enrolled, making it the second largest university in Minnesota. Over 13,000 of the students are Minnesota residents, and about 1,000 students are international, representing 80 countries. The university was created in 1869 as St. Cloud State Normal School, a teacher training institution, and in 1921, it became St. Cloud State Teachers College. By 1957, it had added more programs and became St. Cloud State College and was elevated to full university status in 1975, when it became St. Cloud State University. It has since grown into a comprehensive university and now awards bachelor’s degrees in over 60 programs and Masters Degrees in over 40 programs. With the school growing larger in tune with the metro area, there are plans to offer PhD degrees in the future. The 100-acre campus is between downtown St. Cloud and the Beaver Islands, a group of more than 30 islands that form a natural maze for a two-mile stretch of the Mississippi river. The current president is Earl Potter, III. The SCSU program is another Minnesota-based program that has benefitted from the growth of hockey culture in the state, established itself with solid to excellent regular season performances, but has struggled at the NCAA tournament level, where multiple appearances have yet to yield a tournament victory. If the Huskies ever do get that monkey off their proverbial back, SCSU may become a dominant power. While SCSU’s history since the mid 1980s elevation NCAA Division I is well known, far fewer hockey fans know about the early days of SCSU hockey in the 1930s, which played a formative role in the development of our sport. "No institution did more for collegiate hockey in the '30's and '40's than St. Cloud," said Minnesota hockey great John Mariucci. The St. Cloud program started poorly in 1931 with a 1-7 season, but for the next 10 years, St. Cloud never had a losing season. The pinnacle was the 1934 season, when the school went 25 -2, but in those days, there was no national tournament. St. Cloud’s 1930s successes were sparked by two well known hockey goalies, Frank Brimsek (left) and Sam LoPresti. Brimsek was the goalie on the 1934 Saint Cloud squad and only played 11 college games, but would later become one of the most famous American hockey players of his era. Brimsek made the rare jump from collegiate to the pro level with NHL's Boston Bruins. He earned the nickname 'Mr. Zero' as a rookie for the Bruins when he led the NHL in victories, goals-against average and shutouts, won the Calder Trophy and led the Bruins to victory in the Stanley Cup playoffs. 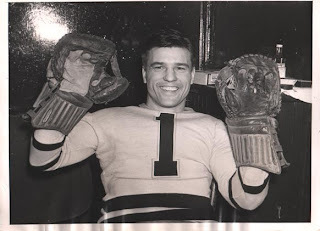 He played nine seasons with the Bruins and one with Chicago before retiring in 1950, and holds the distinction of being the only St. Cloud alumnus to be inducted into the United States Hockey Hall of Fame and the International Hockey Hall of Fame in Toronto. St. Cloud had no indoor rink in the early days, and during WWII, the program was dropped. After the war, the program was revived on a Division II level in the Municipal arena, where St. Cloud would play until the late 1980s. Enter Minnesota (and American) hockey legend Herb Brooks, who had won a gold medal coaching the “Miracle on Ice” 1980 US Olympic Team and had gone on to coach the NHL’s New York Rangers after the 1980 Olympics. Brooks was looking for a new challenge, and creating the 1980s groundwork for St. Cloud State to become a Division I hockey school became Brooks’ passion. In Brooks' first and only season as head coach in 1986-87, St. Cloud State broke or tied 45 school records on the way to a 25-10-1 record and a third place finish at the Div. II national championships. As the season progressed, so did the excitement of Husky fans, who filled the Municipal Ice Arena. During the 1987 session of the Minnesota Legislature, St. Cloud State University (prodded by Brooks) proposed an $8.6 million multi-purpose sports facility that would include a hockey arena and football field, with the goal of admission into the prestigious Western Collegiate Hockey Association. The arena proposal was ultimately approved in May, 1987 and the doors opened for the first game on Dec. 16, 1989. At the time, the 6,000 seat National Hockey Center was a one-of-a-kind - the only facility that featured two Olympic sheets under one roof. The NHC is still home of the Huskies, and recently-approved multi-million renovation plans should elevate the building into the upper half of WCHA arenas. SCSU made the Division I commitment during the 1986-87 season and the Huskies joined as an Independent in '87-88. SCSU then played an Independent schedule for three seasons, under coach Craig Dahl, highlighted by an NCAA tourney appearance in 1989 when SCSU took the independents’ slot and lost to Lake Superior State in a two-game, total goals series, 10-5. After some strong teams in the 1990s but no league hardware to show for it, the 1999-2000 season was the breakthrough year for SCSU, and opened up a strong run of NCAA appearances in the early years of the decade. The Huskies made the 2000 NCAA tournament, losing 5-3 to BU the East Regional in Albany, NY. Successes followed SCSU in 2000-01, as the Huskies stormed to a school-record 31-9-1 overall record and were second in the WCHA at 20-8-0. SCSU also claimed its first-ever Broadmoor Trophy, defeating North Dakota 6-5 (ot) in the Final Five title game, SCSU also gained its second consecutive bid to the NCAAs, receiving a first-round bye as the No. 2 West seed, but the Huskies lost to Michigan, 4-3 at Grand Rapids. In 2001-02, the Huskies continued their pattern of success with a strong 29-11-2 overall record and another second place finish in the WCHA at 19-7-2. SCSU gained it’s first-ever No. 1 ranking in the Div. 1 polls during the season and held that position for much of the winter. Forward Mark Hartigan firmly established himself as a Husky legend with a school-record 37 goals, 38 assists and 75 points. He went on to become the first player in SCSU history to gain WCHA MVP honors, first team All-American status and a spot among the top three finalists for the Hobey Baker award, but in what has become something of a disturbing pattern for Husky fans, SCSU fell again in the NCAA tournament, this time by a 4-2 count at Yost Arena in Ann Arbor. In 2003, the Huskies had a 17-16-3 season and squeaked into the NCAA tourney, only to be crushed by New Hampshire, 5-2 in the NCAA East Regional. One again, the NCAA well was empty. 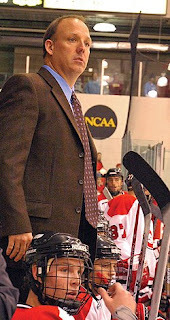 Craig Dahl retired in 2005, and former Denver assistant Bob Motzko became coach of the Huskies. Motzko took the Huskies to a 22-11-7 record in 2007, but once again, NCAA tourney success was not to be, as the Huskies fell 4-1 to Maine in Rochester, NY. 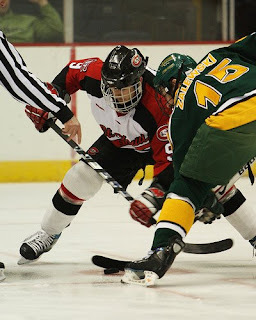 In 2008, the Huskies went 19-16-5 and again found themselves in the NCAA tournament, and this time, Clarkson ended the quest for the Huskies’ first NCAA win with a 2-1 victory. St. Cloud State's nickname has gone through several changes over the years. Early nicknames included "Normals," "Teachers," "Bear Cats," "Peds," and "Flying Clouds." There are several theories about how the nickname "Huskies" began to be used. One says that it is a result of a student contest. Another suggests that the name originated with the football team. There was a story in the February 4, 1938, edition of the College Chronicle (school newspaper) which referred to the "football huskies." Since Huskies was not capitalized in the story, the author could have been referring to the team's size and this possibly led to the nickname. Another theory is that the nickname originated within the football team. "I think it occurred during Coach Kasch's days as football coach (1935-42)," said John Weisman, former SCSU Dean of Men and former coach. "The team just started calling themselves the "Huskies." Why the name was chosen or who exactly selected it remains unclear. The name could have been intended to mean "burly, robust or large," "one that is husky," or "a heavily coated working dog of the arctic region." Perhaps the nickname was meant to encompass all three meanings. Regardless of its origin, the Husky nickname continues to represent SCSU as a symbol and image of strength. The current Husky Mascot is named “Blizzard”. to cheer our team to victory. We're here to show our loyalty, RAH! RAH! and to our colors we'll be true. Richard Dean Anderson - Actor, star of MacGyver television series. Ryan Malone – NHL Hockey Player. St. Cloud is the largest population center in the Minnesota’s central region about an hour drive north of the Twin Cities, and the country seat of Stearns County. The city population was 59,107 at the 2000 census, making it the third largest city in the state outside the Twin Cities metropolitan area, with 167,392 residents in the metro area. The city sits on the Mississippi River. St. Cloud was named after Saint-Cloud, the Paris suburb, by John Wilson, a Maine native with French Huguenot ancestry. Wilson later said that his decision came from his interest in Napoleon, whose favorite palace was located in Saint-Cloud, France. Historically, St. Cloud was a waystation on the Middle and Woods branches of the Red River Trails between the Canadian border at Pembina and St. Paul. The St. Cloud area had been opened to legal ownership by non-Native Americans following treaty negotiations with the Winnebago tribe in 1851 and 1852, and the City of St. Cloud was incorporated in 1856. St. Cloud Normal School opened in 1869, and since then, St. Cloud has always been a college town as well as the country seat. Steamboats once docked at St. Cloud, although river levels were not reliable. Granite quarries have operated in the area since the 1880s, giving St. Cloud its nickname, "The Granite City." Today, St. Cloud has enjoyed some brief moments in pop culture. Courtroom scenes in the Disney Film The Mighty Ducks were filmed in St. 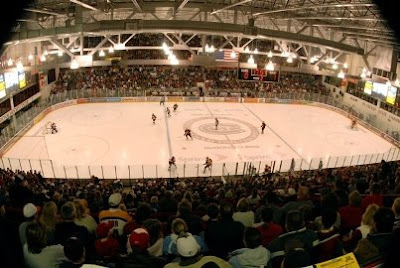 Cloud, and in-game hockey scenes were filmed at the National Hockey Center at St. Cloud State University. The acclaimed 2007 film Juno was partially set in St. Cloud, however, none of the shooting actually took place in the city. The song "On A Bus To St. Cloud", by Gretchen Peters, is on Trisha Yearwood's 1995 album "Thinkin' About You". DU loves to play in St. Cloud, as the Pioneers are 7-1 in the last eight meetings against the Huskies at National Hockey Center, including a pair of 3-2 wins last season. With DU tied for second in the WCHA and St. Cloud State winless after three league games, the pressure is clearly on the Huskies to get into the league win column, while the Pioneers look to establish some road credentials this season. DU and St. Cloud both have plenty of offense and solid goaltending, but question marks remain on the defensive side of both teams. On paper, SCSU has the third best offense in the country at 4.00 GPG, however, the Huskies have not played a very difficult schedule to date, while the Pioneers are fourth ranked at 3.89 GPG have played tougher opponents. With the big ice and defensive question marks on both teams, we can expect a fairly high scoring series. SCSU’s Garrett Roe is one of the most dynamic offensive players in all of college hockey, and the Pioneers counter with Tyler Bozak, who will be looking to elevate his game on the big ice at the usually buzzing National Hockey Center. SCSU has the better power play at 20.6% but with DU coming out of their own power-play blues with a solid 4-for-13 (30.7%) effort in the two-game series against Minnesota Duluth, Denver will be looking to exploit the struggling penalty kill of SCSU (78.9%). If you are a Pioneer fan, you need to be aware that Pioneer freshmen and sophomores have accounted for 77% of the team’s goal scoring and 70% of the team’s total points. Freshman and sophomores have accounted for five of six game-winning goals. Sophomore Anthony Maiani (4-7--11) has 0-4--4 during his current two-game point streak and Joe Colborne (2-2--4) netted 1-1--2 in the 2-1 win over Minnesota Duluth, and how the young players respond on the road is likely the key to success. DU is top to bottom, a better team than SCSU is right now, and on talent alone, a DU sweep is very possible. That said, this is the WCHA, SCSU is hungry and at playing home, and the Pioneers are not a proven road team as yet. I am going to predict a split. 5-3 SCSU on Friday, 6-2 Denver on Saturday. I'll go with the DU sweep but I don't feel good about this one. Huskies should be able to put up a solid fight at home.